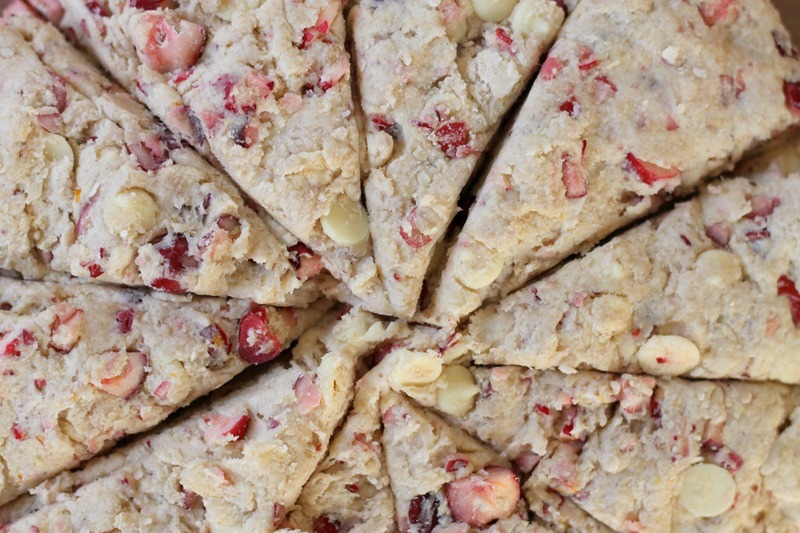 The combination of cranberries and white chocolate is a wonderful one. The sweetness of the white chocolate seems to really work well with the tartness of the cranberries. In fact, one of our favorite store-bought cookies is the white chocolate cranberry oatmeal dunker from Trader Joe’s! It is the best! Anyway, back to the scones. These scones are possibly the most tender ones you will ever eat (which is funny, considering how half the flour in them is whole wheat). They are easy to whip up and are perfect for breakfast or brunch. We sent some to our grandparents, who love scones and usually don’t get them homemade. 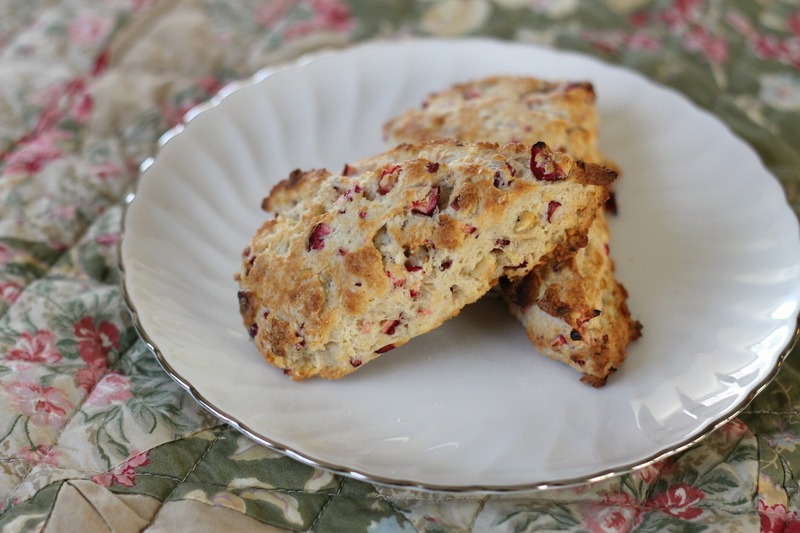 They pronounced these “the best scones we have ever had!” That is high praise, and we hope you will try them soon and find them to be as delightful as we did and they did! Preheat oven to 425 degrees. Line a large baking sheet with parchment paper. In the bottom of a large bowl, whisk together flours, baking powder, sugar and salt. If you don’t have a pastry blender, cut the butter into small pieces with a knife and work the butter into the flour mixture with your fingertips until the mixture resembles coarse crumbs (if you do have a pastry blender, no need to chop the butter- simply add it to the bowl and use the blender to break it into the flour mixture until the largest pieces are the size of small peas). In a food processor, pulse the cranberries a couple times until the are broken up. Add the ricotta and heavy cream and stir them in with a rubber spatula to form a dough. Stir in the cranberries and white chocolate. Using your hands, gently knead dough into an even mass in the bowl. Transfer the dough to a well-floured counter (or floured circle of wax paper), flour the top of the dough and pat it into a 7-inch square about 1-inch tall (we just made a large disk and cut the scones into wedges). With a large knife, divide the dough into 9 even squares. Transfer the scones to prepared baking sheet with a spatula. Bake the scones for about 15 minutes, until lightly golden at the edges. Cool on the pan for a minute, then transfer to a cooling rack. Let partially cool, then serve warm. Enjoy! Note: Feel free to substitute the fresh cranberries with dried if you like! Ooh, these are so pretty! I love the little pops of red! Thank you! I found some great recipes that other people linked to!